Bookings for two or more made directly with us will go out with their own instructor up to a maximum of 5 people, larger groups will be split between more instructors. All sessions include 35 clays per person, 35 cartridges, gun hire and safety equipment which is mandatory. 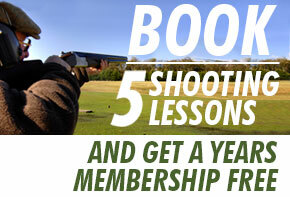 Lessons are tailored to the customers experience and cost £65 for a 1:1 lesson and £50pp for a group. Clay pigeon shooting in Yorkshire is an experience like none other. Line up your shot against the backdrop of the beautiful Yorkshire Dales and watch your clays arc through the skies as you hone your hunting technique. Set in the 1400-acre Coniston Estate near the picturesque Yorkshire market town of Skipton, this clay pigeon shooting venue is one of only a handful to be awarded ‘Premier’ status from the Clay Pigeon Shooting Association (CPSA). This is a sure-fire guarantee of some of the best tuition and facilities in the country. If you’re looking for a fantastic outdoor activity within earshot of West Yorkshire, clay pigeon shooting is the perfect choice as you get the thrill of being a clay hot shot. The centre offers a whole range of shooting disciplines, simulating (amongst others) high birds, rabbits, grouse, partridge and springing teal through a variety of different traps. Each session lasts approximately one and a half hours and you begin with a safety briefing which ensures maximum protection and enjoyment for both you and other clay shooting enthusiasts. Fully trained instructors from this popular Yorkshire shooting school will then show you the skills needed to be a good marksman, so you can showcase your best clay skills. For single-person bookings, lessons are usually conducted one-to-one with an instructor. Please Note: Unfortunately no one who is pregnant can participate on Clay shooting due to health and safety regulations. Where at the ground we are able to offer courses in conjunction with the CPSA for Safety Development, for both Level 1 instructor courses and Level 2 Coaching courses. We will also from time to time run Shotgun skills courses which generally last a day. These are usually tailored to suit the individual and will be intensive courses. All courses are fully certificated which is advantageous with anyone wanting to apply for a shotgun certificate.